Colors and brush of different size. I was playing with few components from Angular Material site. I like the modularity thought coined by Angular Ecosystem. Though it is not mandatory, it definitely imbibes a good development practice. I noticed that the Material site comes with default Angular Indigo-Blue theme. 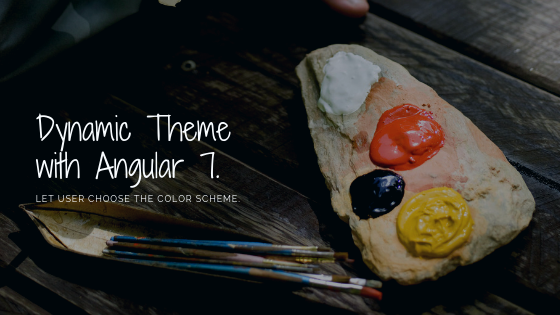 While the theme is quite soothing for the eyes, the site also offers an option to change theme via Theme Picker. Make sure the CSS structure remains same across all the CSS variants. Query for “Link” tag which should be dynamically replaced. Assign the new CSS reference to the DOM node located in above step. Digging into the source code definitely helped me to understand how the whole magic works. There are few things we must follow. If you are to eager to know what we are going to do, here is the summarised list of activities. Create a folder “custom-themes” inside src/assets folder. This will contain various theme files. Use scripts or node-sass from a command prompt to generate CSS for theme files. Modify Angular.json to include each CSS file as a separate bundle. Create a component to select themes of your choice. (Optional)Create a component to store the theme preference. This is useful in case of page refresh and you wish to retain the settings. You must be already aware of how to generate Angular project from command line. There is no fancy trick. Make sure that you have Angular CLI installed at a global location. It can be done using the following command at command prompt. For those who are not familiar with this command, it doesn’t matter which directory you are in. The -g parameter will do all the magic of installing CLI at global location. Now that we have Angular CLI installed, execute following command to generate a Simple Angular Application with default settings. When prompted for routing, select “y” (Not required for theming, but you can test the effect with different modules). For CSS, choose SCSS as option and then wait for CLI to do it’s job. Indicates that we are going to use Angular material theming. Define basic color references required to create a theme (primary and accent). Refer to the custom theme defined in app-theme. There is not going much here. We are just referencing few color references that were passed via theme object and include additional theme references present in the project. The default theme options look good, we should now proceed with defining alternate themes. I actually copied theme references from Angular Material project. // Define the light theme. // Define the dark theme. The most important component of the project – A Theme picker. Looking at the source Material source project, the theme picker is very simple component. It has a button with color picker icon and a menu with color swatches. The ThemePickerComponent.ts file contains logic to switch from one theme to another. First we proceed with collection of colors and reference to CSS files. Next we inject the reference of StyleManagerService into constructor. This is a custom service to manipulate DOM nodes and load CSS on demand. Next a function to configure the theme. The function ensures that each time user makes a selection of a theme, it is loaded via StyleManager. In case if a default theme is selected, the dynamically loaded theme has been de-referenced from the HTML. Locate link rel tag with a given custom CSS class name. The class name acts as an Identifier. If the tag is available change the href attribute to point new CSS file. If the tag is not found, create it and then add it to document head. You can now reference <app-theme-picker></app-theme-picker> wherever you want. You can access the entire source code using following Github Repo.